Kiln forming glass-melting cut or crushed glass together in a kiln until it becomes a single piece and shaping the glass with molds-has quickly become one of the most popular subjects in studio glasswork. This comprehensive introduction covers all of the fundamentals, such as fusing, slumping and draping, as well as some intermediate and advanced techniques, including pot melting, inclusions, mold-making and more. 19 exquisite projects, arranged by skill level, range from home décor items, like a wall sconce and fountain, to sculpture, and even an amber glass pendant. 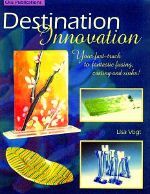 This guide contains all the skills and tools you need to get started in the world of glass fusing. It will talk about what type of glass to use and how to cut it; how to work with a kiln from setup to project completion; how to make your own molds and glass accents. 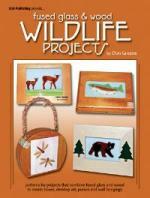 Includes instructions and full-size patterns for 18 projects: bowls, vases, plates, windchimes, candleholders, and more! 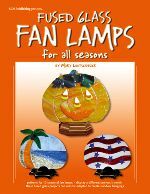 Illustrated with hundreds of step-by-step photos, a gallery of inspiring projects, and a list of glass fusing resources. 160 pgs, 670 color photos, spiral bound. 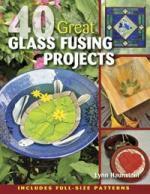 Includes 20 exciting projects for the glass fuser. The projects vary in skill level and application. Vases, bracelets, clocks, and a bottle slumping firing schedule are just a few to choose from. The selection of projects were chosen from the favorites taught at the Vinery. 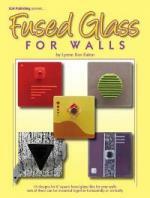 This book will be a great guide for retail stores teaching fusing classes or for the hobbyist that wants to work independently. Provides clear step by step instructions and pictures. 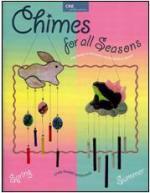 Contains patterns for wind chimes for every season, holidays and special events. There are chimes for Christmas, Easter bunnies, New Year’s hats and champagne glass, Valentine hearts, autumn leaves, hummingbirds, ribbons or remembrance and more. 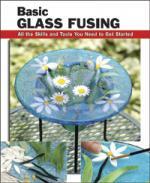 With its illustrated, step-by-step instructions, this is an excellent book for beginning fusers and stained glass craftspeople alike. Full of fused Christmas cookies, Gingerbread boys & girls, a Christmas tree, a 3D gingerbread house and church. Uses System 96 glass. Firing directions include as well as glass choices. Why not have a reminder of Christmas all year? Extensively revised and expanded! 30% larger than the previous release with an improved tutorial and expanded sections on inclusions, surface techniques, pattern bars, high temperature firing, and more. Basic fusing and slumping projects, such as making coasters, tiles, bowls, and platters. Complete instructions for compatibility testing and annealing, including master firing schedules for fusing, slumping, and kiln casting. 208 pages with over 200 full color illustrations. Your fast-track to fantastic fusing, casting and sinks! Includes firing guides. Patterns include clocks, candle holders, picture frames and much more. 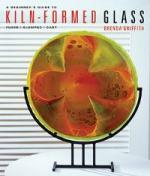 In this book, glass fusing is taken to a new level of sophistication. Ignited by curiosity, fueled by experimentation, you will find proven kiln crafting techniques approached from totally new directions. The result is a collection of incredibly exciting, awesomely fun, and often super-easy fresh new project ideas. The first Fusing and Slumping "hands-on" manual of its kind has been updated with the latest fusing techniques and is now available in paperback. A user-friendly, easy-to-read, step-by-step lesson on how to fuse and slump, including information and pictures on what tools to use and how to use them correctly. Learn how to choose COE, measure glass, work with ceramic and stainless steel molds, and how to set firing schedules. Includes hundreds of tips and pictures to help make the learning process fun! 109 pages. Contains 37 metal clay artists featuring 62 unique art-pieces. The work is showcased using high quality images taken at various view angles to enable the viewer to make a complete inspection of the piece – as if they were holding and turning the piece in their own hands. Each art-object is accompanied with a brief commentary about the artist’s work, a listing of statistics for the piece, plus the information on the artist. Hot Techniques for Cool Projects. This 36 page book shows how to ramp up your skill level using various simple techniques in combination to create striking, artistic pieces. Both beginner and advanced fusers alike will find inspiration in the clever project shapes and more than 30 full color photographs showcasing the finished projects in sizzling trendy color schemes. Comes complete with more than 30 patterns, tips for project layout, stenciling and glass embossing, individual project assembly and firing instructions, plus fusing, slumping and draping firing guides for the projects included in the book. 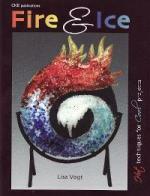 Choose from over 30 art glass fusing projects designed to spark your imagination and ignite your creativity. This flashy assortment of easy-to-make projects features many holiday designs, including Halloween, Christmas, and Hanukah. 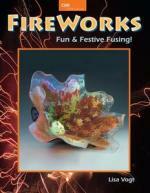 Make beautiful fused bowls, plates, decorations, flats, and even kites! Choose from abstracts, marine life, flowers, frogs, and even a US flag. Firing guides and assembly information included. All projects shown in color pictures to assist in glass selection. Looking for projects for tabletop kilns? Want to use up your scrap glass? 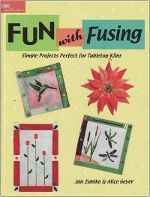 Fun with Fusing contains 29 projects perfect for small kilns, classes and quick gifts. Make suncatchers, trivets, coasters or incorporate these designs into larger projects. Included are lots of fun animals, giraffe, panda, elephant, lion, puppy dogs, fish, hummingbirds, dragonflies and other fun subjects. Included are step-by-step instructions for construction, including how to make your own glass nuggets, materials lists and firing schedules. 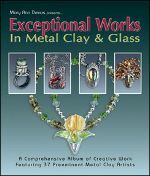 Introduces new ways to utilize the bonanza of glass forming methods & materials through 18 lessons with names such as: Wear It (Jewelry), Display It (Holders), Hang It (Mirrors & Ornaments), Screw It (Clocks & Sculptures), Drop It (Vases), Zen It (Fountain), Rake It (hot combing), Sell It (marketing your work), plus 10 more. Fuse It will be a valuable resource for fusers of all skill levels with a desire to progress to the next step. 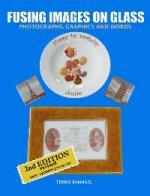 More that 300 color photos offer a wealth of instruction and inspiring ideas for distinctive kiln formed creations. 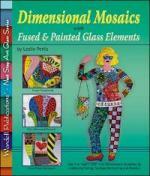 If you′re running out of window space for your art glass creations, this book is what you need. Here are 15 contemporary designs for fused tiles to decorate your walls. Each tile is only 6"x6" so you can create them in even a very small kiln. These tiles are intended to be created in sets of three (or more) and then mounted, using hardware from Hang Your Glass, so that they "float" an inch or so in front of your wall. You can display the tile sets horizontally or vertically, depending what kind of space you are trying to enhance. Or use them individually to liven up a small nook or cranny. Teaches how to easily, safely and inexpensively fire high quality photographs, graphics and text onto their fused glass projects using Fired-On Photo Fusing Decal Paper and any HP Black and White Laser printer. Takes all the guess work out of this exciting process giving step by step instructions and project ideas including instructions for colorizing sepia images. Filled with beautiful full color detailed photographs of exciting projects such as Wedding Invitation Plates, Family Portrait Brooches, Kids Own Drawing Tiles, Illustrated Stained Glass Panels and Treasured Family Recipe Platters. All fired images are permanent and food safe. There are times when we would love to repeat a perfect firing outcome or an amazing, but unanticipated effect. There are other times when we have disappointing results that we would like to avoid in the future. 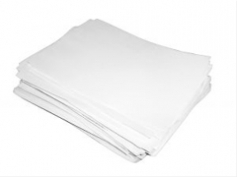 These Fusing Log Sheets come in a writing pad style with convenient tear off pages. Each log page is pre-printed (in 2 colors) with easy to use check boxes for the most common types and styles of fuse firings. There is a space to describe the glass & components in the project and another to make a simple sketch. Then a conclusion and observation area is available for comments and suggestions to help you make appropriate decisions when planning similar projects in the future. 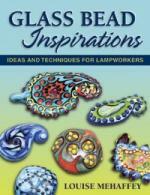 128 pages of creative ideas for making glass beads. 8 skilled beadmakers are given the challenge to create beads based on an inspiration--a color, a season, a painting, an emotion to see what they will create. The results are 323 color photos of their designs showing the variety of creative responses. 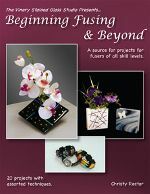 Includes step-by-step techniques for using other materials with the glass to create unique beads.